G.P. Schafer Architect designs this Federal entry for a country house in New York. Note the brass hardware and strap hinges. It is the first element that engages guests before they step inside, it sets the tone for the style of the rest of the period-style house and adds welcoming age-old character and charm. With the addition of classical millwork and glass side panels and transoms, the front door becomes a signifier of timeless design. 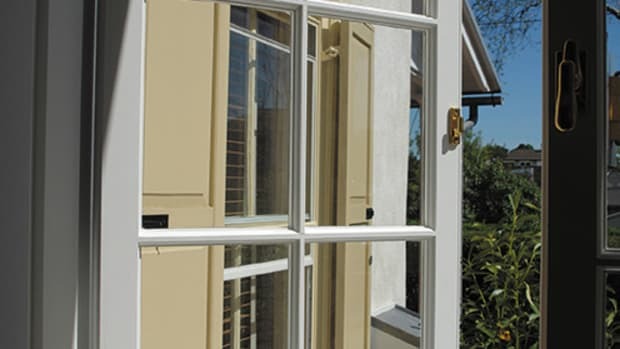 In all styles of traditional architecture, there are a variety of ways to make the entry stand out, whether the door is a plain and simple Shaker or a fancy Victorian Painted Lady. The choice, Wyncoll adds, is becoming even more crucial because front entries are getting wider, taller and more sophisticated in style. 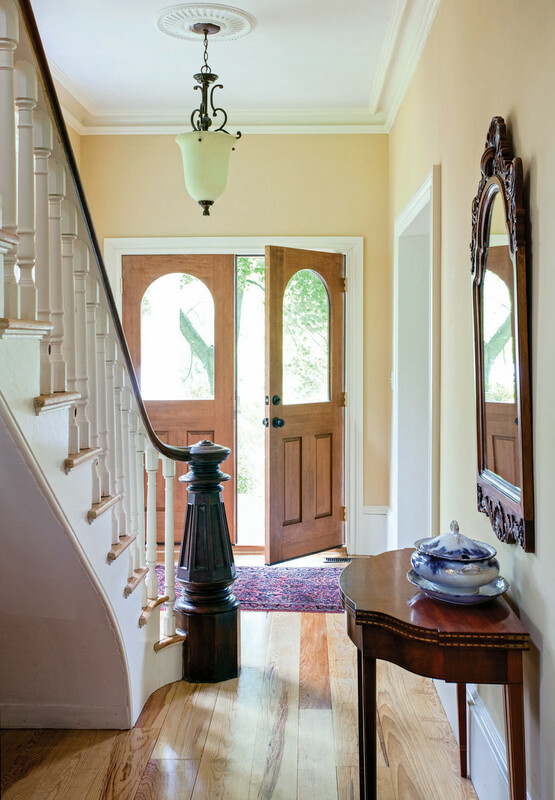 Sidelights in the Federal style give this house a look of authenticity. 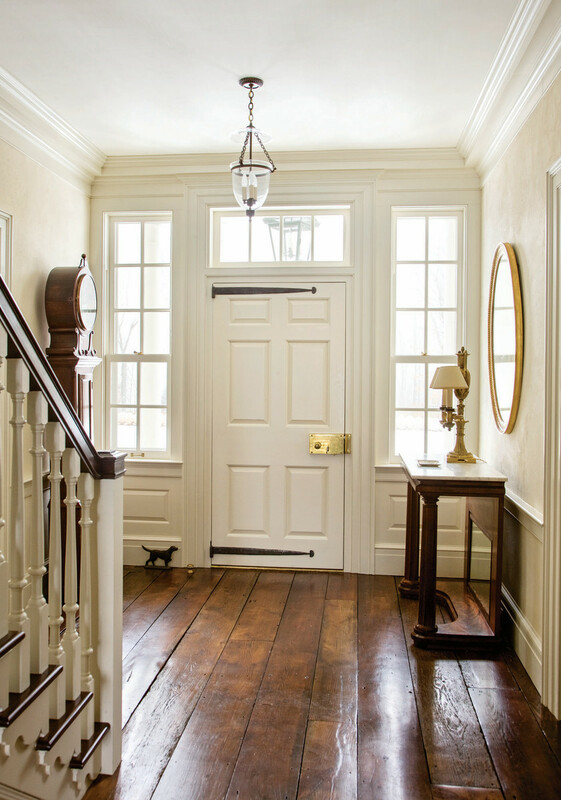 Although period-style doors are available in various materials, including aluminum cladding and steel, wood generally is the preferred choice for full-scale historic restorations and for homes where authenticity is desired. White oak, Douglas fir and pine also are top choices, according to Safford. 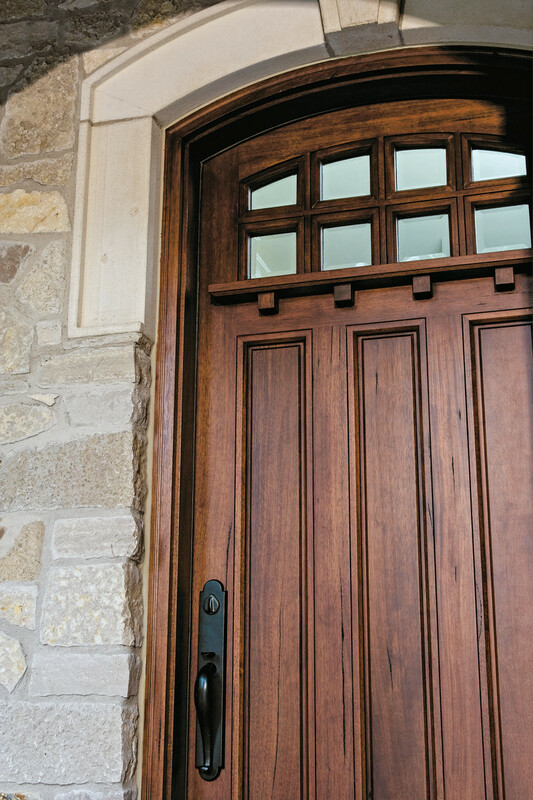 Pella’s Architecture Series offers wood entry doors as well as high-end Fiberglas-skin doors. This double door with arched glass window is a hallmark of the Victorian-era style. The choice of paint or stain depends on the architectural style of the house and, to a lesser degree, the preference of the owner. Pella, which offers 27 paint colors, is expanding its seven-option factory-stain choices. 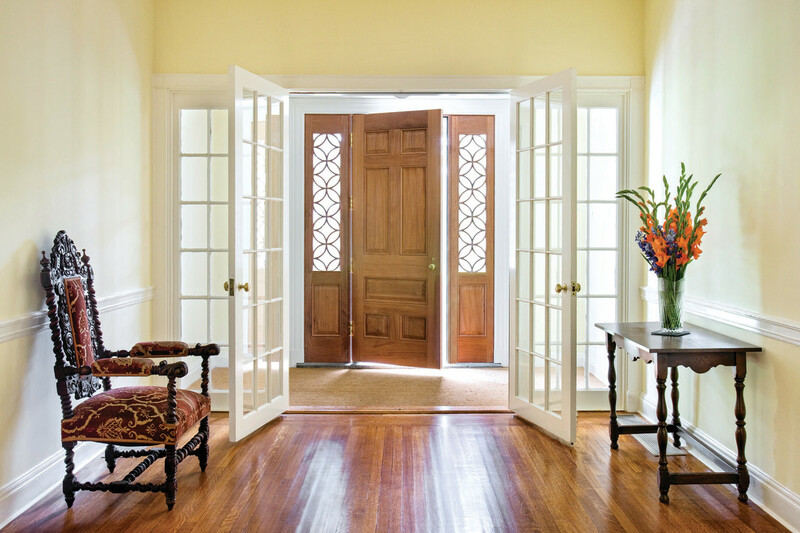 Even if the door is stained, contrasting paint colors allow the trim to become a defining feature. Architect Jim Collins incorporates French doors into this North Carolina home, which floods the interiors with natural light. 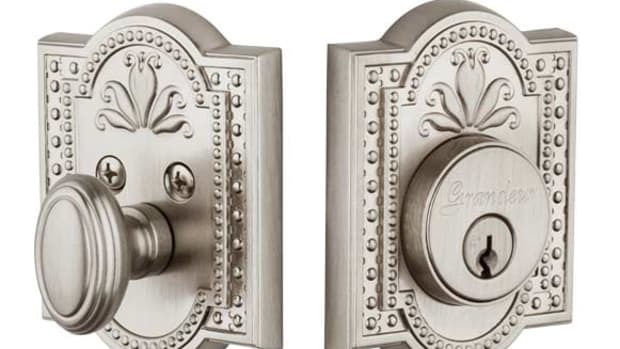 While traditional polished brass hardware is still a top choice, homeowners are starting to request different finishes. “Recently, we are seeing a bigger request for muted or brushed,” Vanderwilt says. 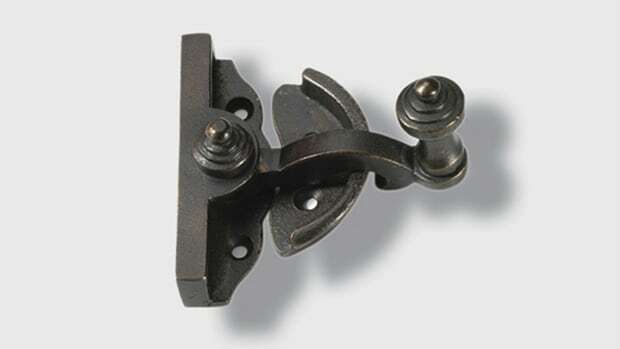 At Parrett, the most popular orders are brass, bronze, oil-rubbed bronze and nickel finish (bronze finished in a silver color). The Tudor-style door echoes the trim on the entryway. The new bigger doors are ideal bases for surrounding sidelights and transoms as well as columns and capitals and pilasters and porticos. 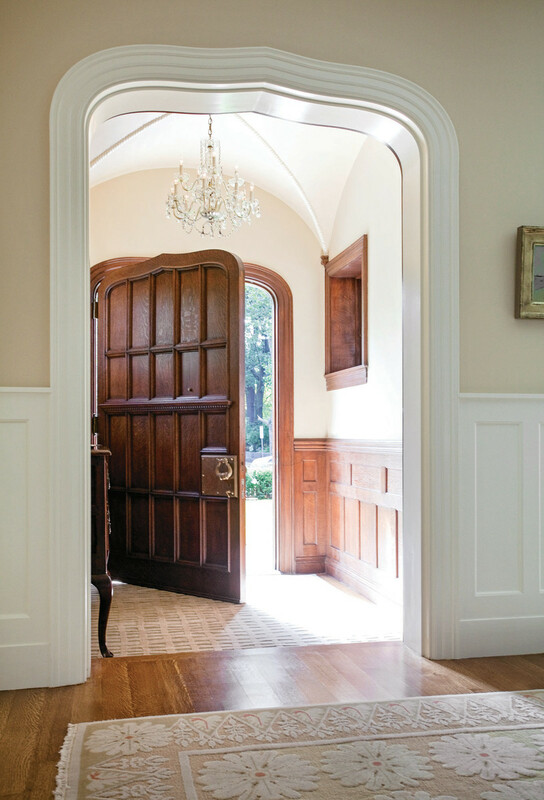 “We’re seeing a lot of sidelights and transoms because it’s a specialty for us,” Wyncoll says, adding that Historic Doors creates architectural doors and millwork for site-specific needs. In most cases, Safford says, the panels have insulated glass. Decorative glass dominates, he adds, because not only is it attractive but it also provides privacy. Patterned glass, Wyncoll adds, is a subtle way to add texture. Safford says divided light, where a grill pattern is created with separate panes of glass, is an attractive option. 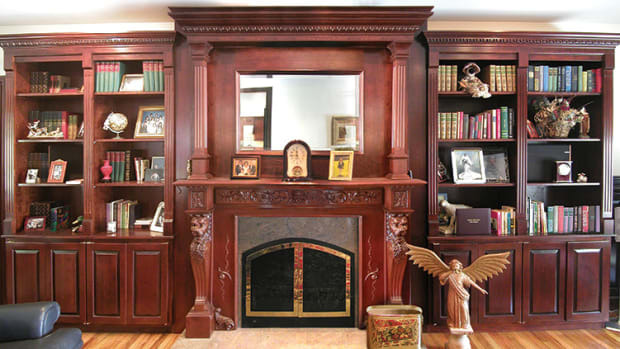 Pella designs doors with Arts & Crafts detailing. Photo courtesy of Pella. 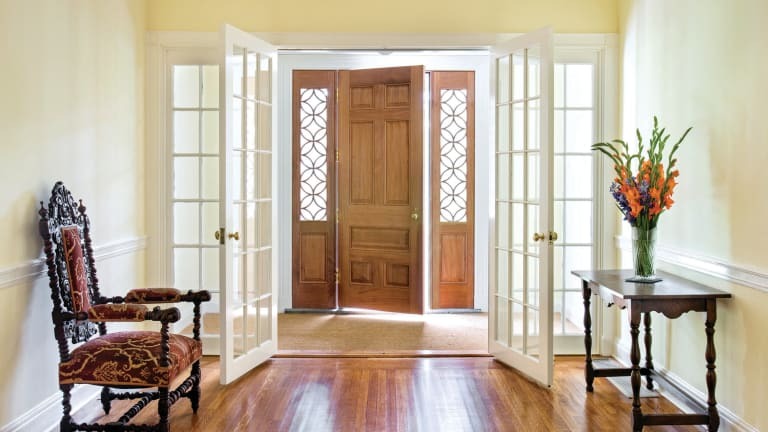 Screen doors are a simple way to add style or dress up an ordinary entrance at a fraction of the cost of a period-style wooden front door. They are available not only in standard rectangular shapes but also in arch-top and round-top styles and can be painted or stained to blend in or stand out. Coppa’s doors are fitted with Phifer Ultravue, a screening material that’s virtually invisible so as not to obscure the architecture of the front door. When Historic Doors customers request a screen door, the company creates designs that are compatible with the custom front door.